This winter, renew a classic Vancouver tradition and enjoy some old-fashioned fun. 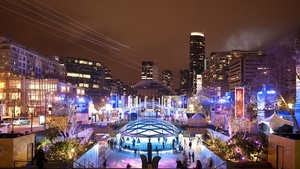 Robson Square’s outdoor skating rink is open, so celebrate winter in style with free skating in the heart of downtown Vancouver. It’s a magical place to enjoy the holidays with your friends, family and loved ones. Skating at Robson Square is free if you bring your own skates. We offer skate rentals for $5/pair. Helmets are also available. Free Ice Skating at Robson Square is an annual event that we look forward to each and every year! We will update this page with new dates and times as soon as we know.